Mike and his Ric 4003 bass. Need an accomplished bassist or keyboardist who sings harmonies and occasional leads? How about a quieter solo pianist (singing optional)? Let Mike know! He’s always on the lookout for gigs in “Greater Massachusetts.” In addition to being in Usually Normal and Throwback, Mike has done standard and emergency fill-ins. Mike began classical piano lessons at age 7 and trumpet at age 9. He picked up bass guitar in high school to form a band with friends who played guitars and drums. Mike has been fortunate to play with such bands as Usually Normal, Throwback, The Skinny Ties, and Sherman & the Waybacks. Bass influences include Paul McCartney, John Entwistle, Bruce Thomas (Elvis Costello), Bruce Foxton (The Jam), and Carol Kaye (Motown and just about everything else). 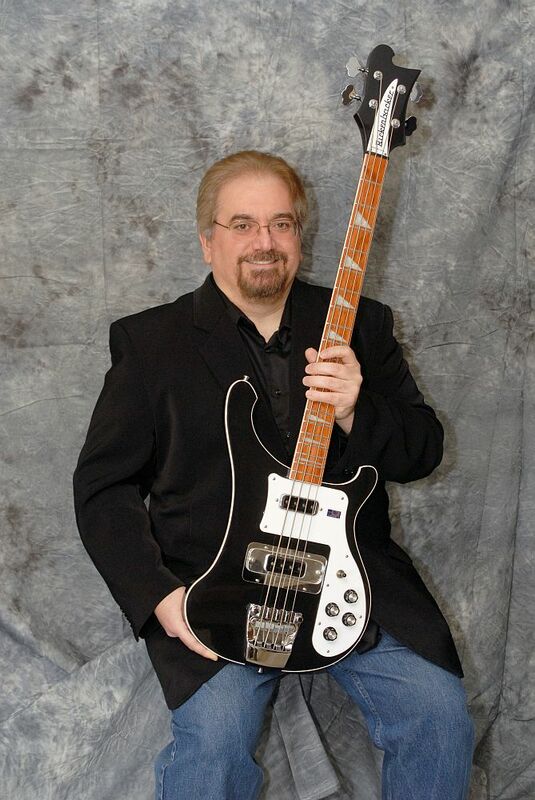 Mike’s primary bass is a Rickenbacker 4003, but he sometimes plays a Hofner V62, Yamaha RBX170, or his son’s very cool red Fender Squire bass. For keys, Mike currently uses a Yamaha MM6 synth, based on its combination of good sounds and portability. Previous/Other keyboard gear includes Nord Stage, Nord Electro 2, and Yamaha PSR-GX76. In reality, Mike’s voice is too high to be a good barbershop bass, yet too low to be a rock high tenor. Being generally unfamiliar with reality, he ignored the former limitation and continues to ignore the latter, singing harmonies and occasional leads as long as his bandmates allow him. Mike bats & throws right, should you be one softball player short. Mike made All-State Band in high school, but this accomplishment has no gig-related benefits, as it was on tuba. Mike has been in bands from high school through college, pausing during grad school. In retrospect, he debates the wisdom of both graduate school and not gigging during that time.